The picture above is not me but it is a picture of what happened to me on this rainy, September, Monday morning in Cincinnati, Ohio. I was doing my normal morning routine walking to the bus stop at 6:40 a.m. 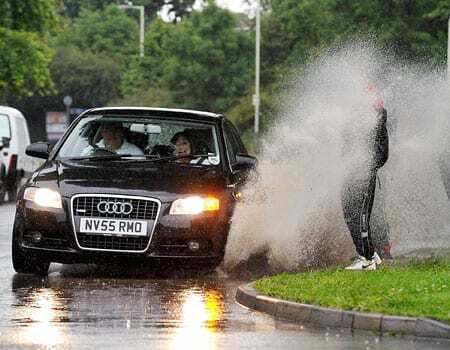 I was on the sidewalk with my back turned to traffic when all of a sudden a car sped by and showered me with a rain puddle, just like in the picture. Luckily, I was carrying an umbrella that protected my head, but from the waste down, I was drenched. To make matters worse, there was a car directly behind the first one and because I did not have enough time to jump out of the way, the second car got me as well. In other words, I got a double whammy. At this point, I thought about turning around and going back home, but being the dedicated employee that I am and I did not want to be late, I decided to keep on trucking to the bus stop. Of course, the rest of the way I was cursing my husband for not getting out of bed and driving me, and then I was hoping for heat on the bus, but got air conditioning instead. I pretty much froze during the 40 minute ride to my stop. However, the air conditioner probably worked to my benefit because the air movement helped dry me out a little. Of course that did not help much since I had to get back out in the rain and walk two blocks to our building. It was during this walk that I drew a picture in my head of the whole incident, and I just started to laugh. I am sure those people in the cars that sprayed me had a good laugh too. Even as I felt my feet squishing in my damp, soggy shoes with each step I took, I still continued to smile. After all, it was just a little water and by mid-day I should be pretty well dry. Needless to say, the first thing I did when I got to work was write this blog while I was still dripping wet and it was all still fresh in my mind. I was struggling with a good topic for this week’s blog anyway, and imagine that–I was showered with an idea. The whole point of this story is to just bring a little laughter to the work week and if my pride had to be bent out of shape a little in order to do that, it was worth it. Well, I am sure my week is going to quickly turn very busy in the world of transportation here at HG Logistics LLC, just like many of yours will be also. But I hope through all the craziness, you will be showered with moments of laughter. If anything, take a walk in the rain. You may be surprised by what will hit you.